“In the movie,” Nick explains, “Gloria was murdered by a demonically possessed psychopath. Her head was smashed in a door and her hair and body were drenched in blood. Another make-up artist, Robin, dealt with her and I looked after other actors on the set. But when Robin had an end of production party to go to, he asked me to clean Gloria up at the end of a LONG shooting day”. Gloria assisted Nick on movies like KRULL and THE HUNCHBACK OF NOTRE DAME. Together they wrote the movie INSEMINOID, Directed by Norman Warren, (who directed the movie that they met on). She would help Nick assess prospective movie projects, reading scripts while he worked in the studio, marking relevant sections and helping him make a quick assessment of the effects needed. She supported him when he wanted to sail the Caribbean, even though she has never sailed in her life. She supported the change of lifestyle when they started their first galleries in Antigua, despite a major drop in income. 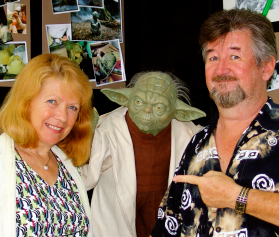 She worried about admin, leaving him free to be creative and just when they were settled in their island home, supported his choice to pick up roots and move to St Maarten to create the Yoda Guy Movie Exhibit.